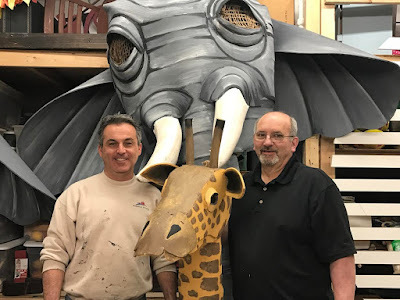 MODULAR HOME BUILDER: NJ Modular Home Builder Helps Produce "The Lion King Jr"
NJ Modular Home Builder Helps Produce "The Lion King Jr"
BRICK, NJ – What has a retired movie set constructor and local builder singing Hakuna Matata? Robert DiGrigoli and Anthony Zarrilli are busy bringing the Pride Lands to life for BCCT’s production of Disney’s The Lion King Jr. at The Strand Theater March 31-April 2, 2017. DiGrigoli and Zarrilli have been charged with designing and constructing the animal puppets for the iconic opening scene Circle of Life where the animals of the Pride Lands are summoned by Rafiki to baby Simba’s royal presentation. Scheduled to grace the Strand stage at the end of the month are two larger than life elephants, high-rise giraffes, three rhinos, four zebras, four leopards, eighteen antelope, a pride of lions and an amazingly talented cast of young people. Together, the duo delivers the perfect mix of creativity, artistry and engineering. Robert DiGrigoli spent much of his career constructing sets for major feature films including Enchanted, The Perfect Murder, Home Alone 2, and Fatal Attraction. After retiring, DiGrigoli began working with BCCT designing sets for many of their summer productions including Wizard of Oz, Annie, Shrek and Willy Wonka. Anthony Zarrilli is the founder and owner of Zarrilli Homes, LLC and has specialized in building custom modular homes along the Jersey Shore for almost 20 years. The animal design team also includes artists Jill Sluka, Chris Hrycenko, Ken Soltis and Megan Brown, who also appears in the production as lead hyena Banzai. Hakuna Matata is a wonderful phrase. Digrigoli and Zarrilli have forged a friendship over the past eight years reminiscent of two of their most recent masterpieces…Lion King friends Timon and Pumbaa. You can find the pair any day of the week working in the BCCT warehouse dancing and singing, sharing stories and splitting cheeseburgers while bringing the magic to life. The Lion King Jr. will bring BCCT’s signature stage presence to the Strand, all under the direction of BCCT founder and 25-year veteran Director Heather Campagno. Scenic Designer and Technical Director Ian Kearns sets the stage with the impressive Pride Rock and the extensive Savannah. Costume designers Kathy Mulvaney and Lorraine Brown are dressing over 50 actors with hundreds of costumes. Choreographer and BCCT alumni Logan Jones, Lighting Designer Bill Simonelli, Chris Everett and the Strand technical crew, and over 60 parent volunteers round out the team. You know the story, characters and songs by heart. Experience it all when BCCT presents The Lion King Jr., a 90-minute musical adapted from the highest-grossing show in Broadway history. A vibrant and exciting musical from the great creatives at Disney, The Lion King Jr. is a theatrical experience not to be missed. Ticket prices are $12 for children 12 and under and $15 for all others, plus a $1.50 service fee per ticket. The show runs approximately 90 minutes with no intermission. Per the Strand's ticket policy, all attendees need a ticket regardless of age. No strollers or carriages will be allowed inside the theater.